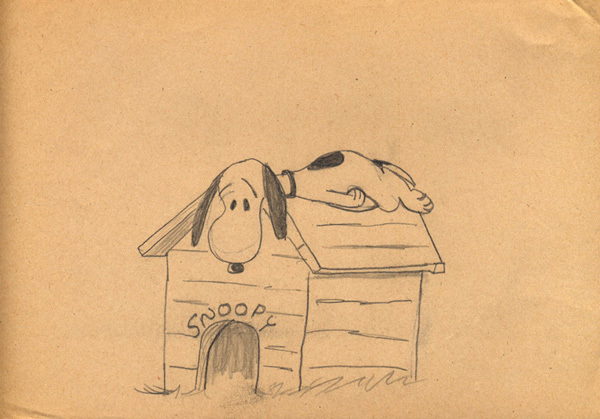 Like legions of other artists, I was deeply affected by reading Peanuts as a child. Also like many others, I first encountered them in the Fawcett paperbacks that were published in the early sixties. 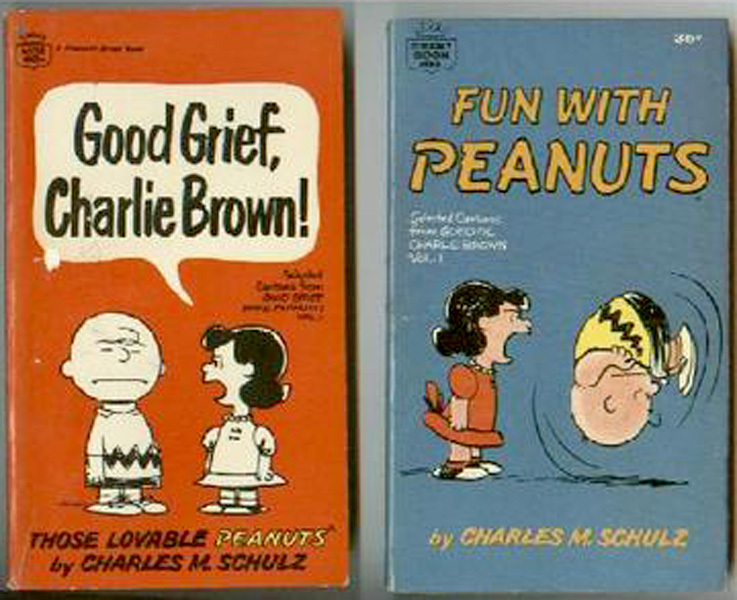 Go to Fantagraphics and get The Complete Peanuts to revisit them and to read about their significance and influence. I won’t try and encapsulate that here. Peanuts was also in our newspaper. I began to cut out the strip each day. I did this for a couple years. When a pile got to about 3 inches thick, I would wrap it in a rubber band and start another. They yellowed quite quickly. These stacks were very satisfying to have and hold. They contained little universes in pictures. I had them until the great New York City apartment fire of 1983 (another story). 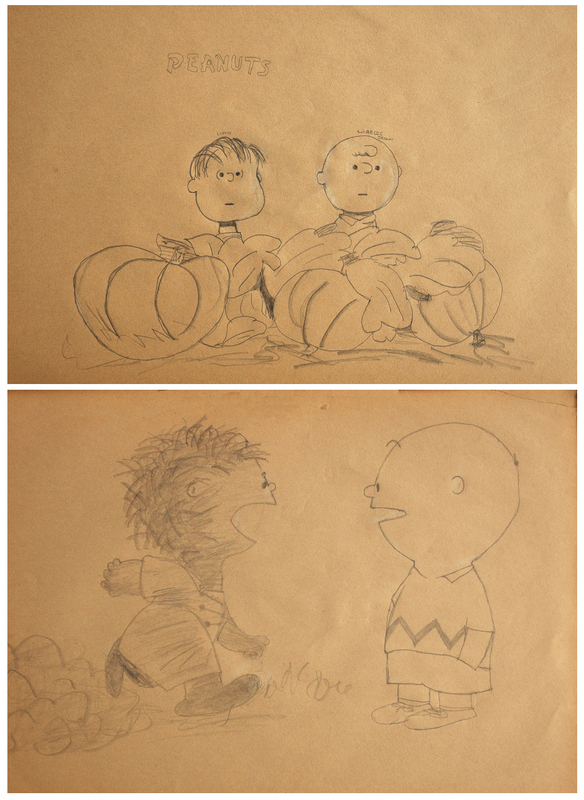 I loved the world of Peanuts – reading them was a totally immersive experience. 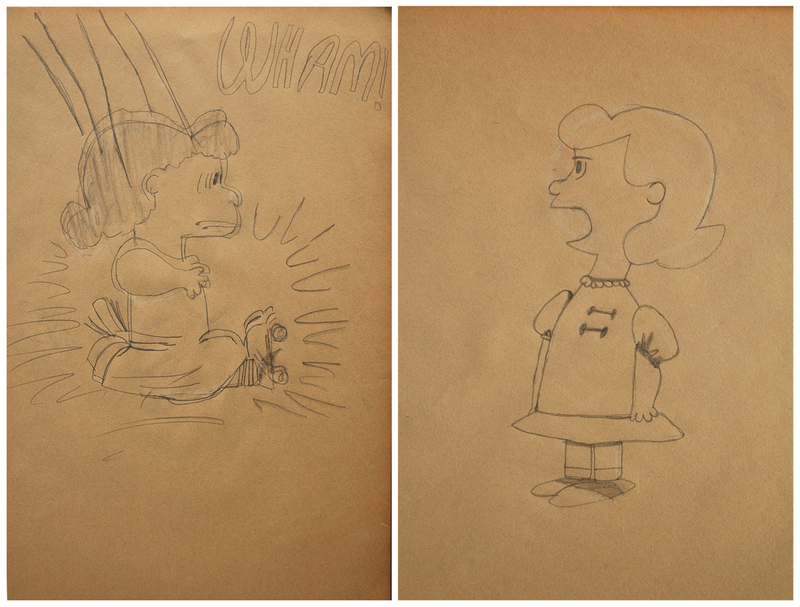 Because it was a visual world, the way I could get closer to it was to draw it myself. 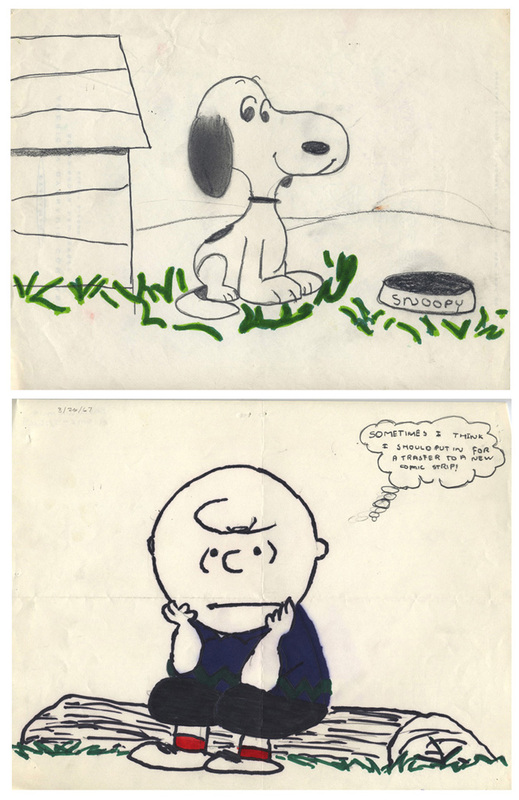 It took Charles Schulz a couple years to nail down the look of the strip, but when he did it was like nothing else. The line work – oh, man – it’s so beautiful. We had this big pad of yellow paper at home – 18” X 24”. It wasn’t newsprint, though it was’t much heavier, but it had a bit of tooth to it. I loved that the paper was so big. I wanted to draw big things on it – not lots of little things – but big shapes. 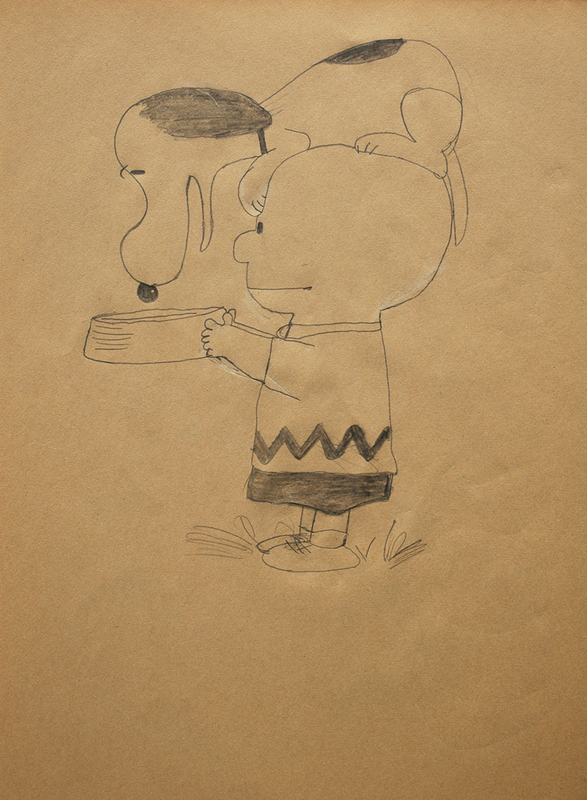 For some reason I decided that Peanuts characters – drawn quite large – would be the perfect thing to fill this pad of paper. Those characters are hard to draw. 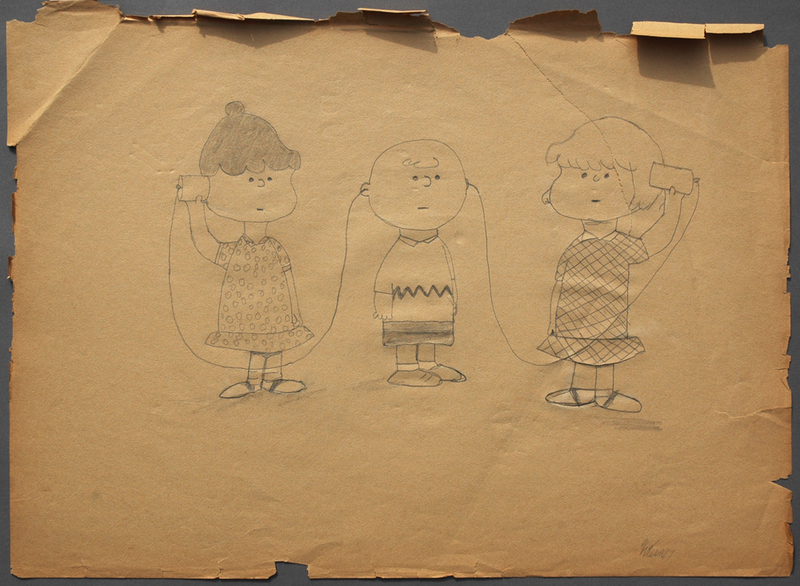 Just try making that round head of Charlie Brown’s. I think I was 9 or 10 when I did these. This first image gives you an idea of the current condition of the pad. It is very brittle. Hey, it’s really cheap paper! Her are a couple of Lucy. Those figures are 12 or more inches high! What was I thinking? Photographing these was difficult – lots of glare. But, if you look closely, you can see where I erased lines – and then covered them with a white pencil to try and obscure the erased lines. Yeah, obsessive at an early age. There’s a lot of white in the one of the pumpkin patch. Funny that I felt the need to identify each character. Like, who wouldn’t know? 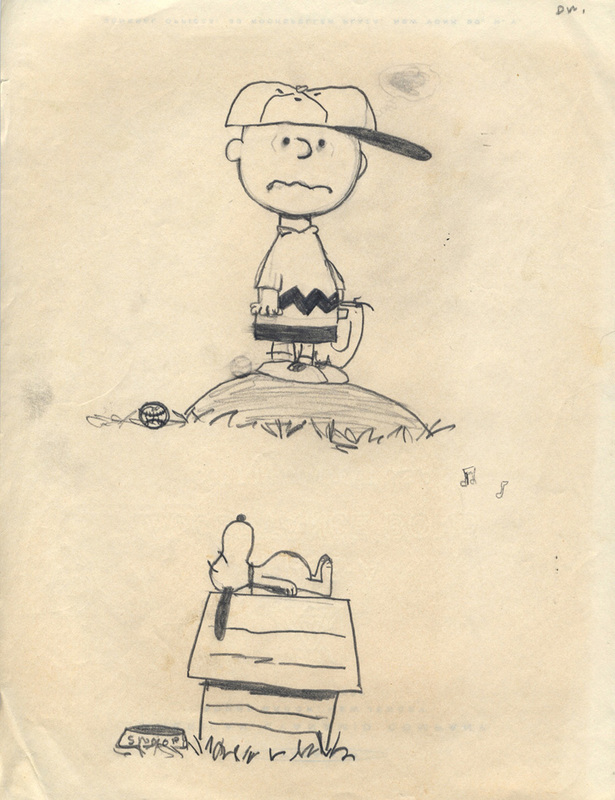 You can see the date on the Charlie Brown above – 1967 – so, I was 11 (Go ahead, do the math). They are 8 ½” X 11”. For some reason I went over parts of them with marker. One more. I was certainly older when I did this. The line work is more confident and it is a more accurate rendering. Again, I’m fascinated that I felt the need to move the baseball, And why are there musical notes floating around? 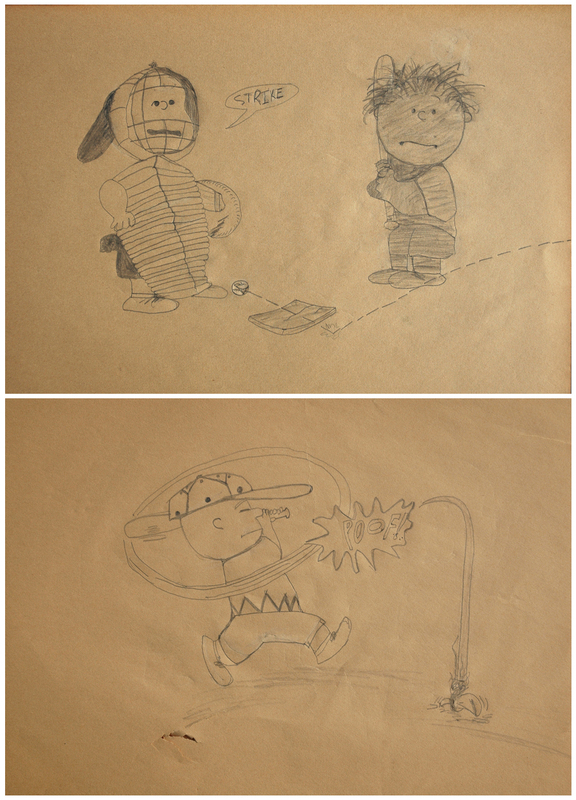 It was significant that, as I got older, I recognized the quality of the drawing in those comics. I admired the weight of the line, the thick and thin of it, and the beauty of the shapes. 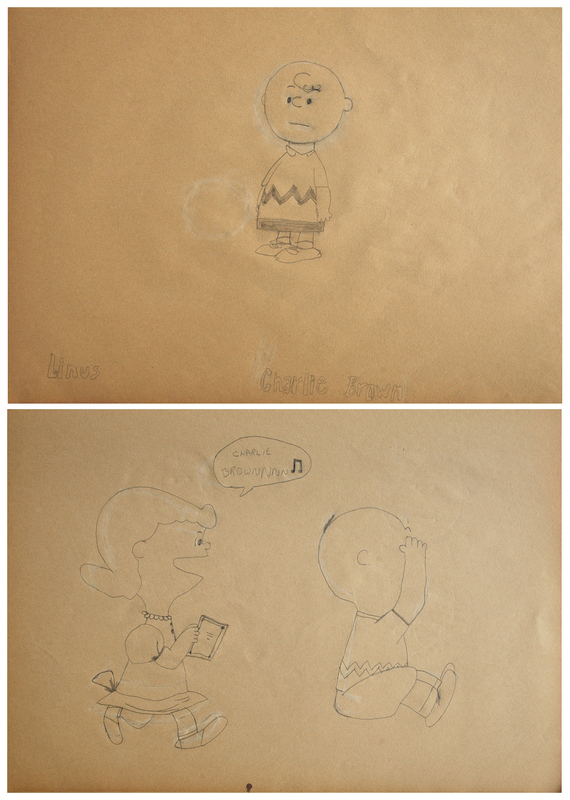 Charlie brown’s head is a remarkable thing! Oh – and they’re pretty funny, too.